A good black creme polish is one of the must haves in every polish addicts collection. I already had two good ones and now I think I’ve found my favorite one yet, Glitter Gal Serpent Black. This black is very well pigmented, a one coater if you apply a generous coat. It also evens itself out perfectly, doesn’t run to your cuticles and if you manage to make a mess it isn’t impossible to clean. 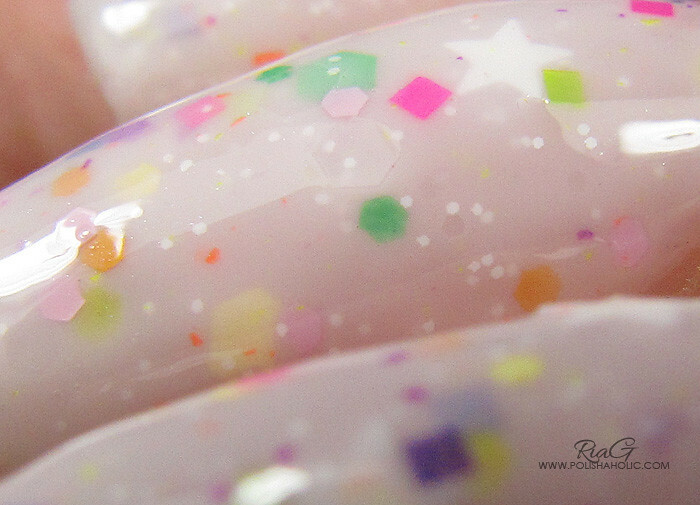 This is listed as a creme but it’s so squishy and glossy that I’d say it’s a borderline crelly. Dry time was also very quick. Just a perfect black! This is one coat of Glisten & Glow Stuck On Blu!, a coat of Serpent Black and HK Girl top coat. Check out Glitter Gal website for more info and their store. ***Serpent Black was sent for review. I don’t benefit from clicking any of the links on this post. It’s about time I show you some of the swatch photos I took during the summer and never posted here on my blog. So let’s start it off with two Dollish Polish pretties. On these photos I still have some gel left on my nails and they are longer than my nails are at the moment. Got Snow Cones? (Glisten & Glow Stuck on Blu! base coat, two coats of Got Snow Cones? and two coats of HK Girl top coat). Application is easy when you use a very light hand to prevent the glitter pieces from dragging bald spots on the white base. It also helps to let the first coat dry well before applying the second one. I placed some of the glitters to get a more even looking result. 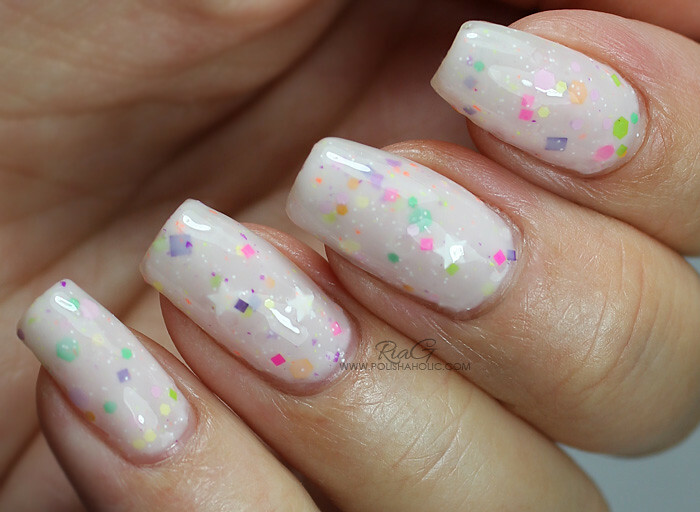 This is such a cute and fresh looking polish! Murky Dismal (Glisten & Glow Stuck on Blu! base coat, three thin coats of Murky Dismal and a coats of HK Girl top coat). This has a very good formula and application is really easy. I used three thin coats to achieve a good sandwich effect. ***These were sent for review. 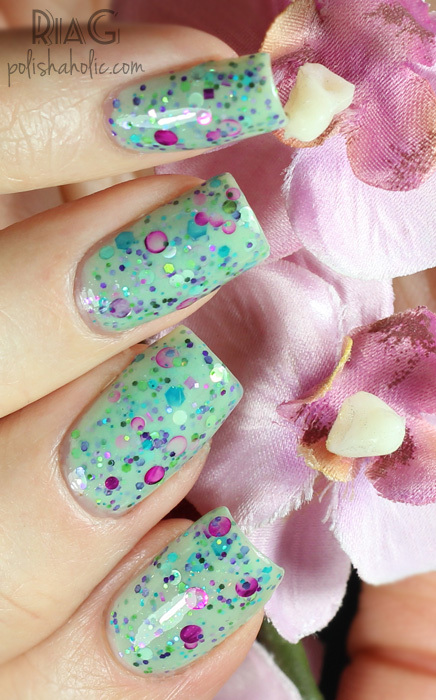 This polish is like a breath of fresh air! I love the simple color combination and quality on this. Application was smooth and easy. No need to fish or place the glitters. This is two normal coats and HK Girl top coat. This awesome jelly is so juicy and squishy! Such a vibrant purple glitter bomb, a jelly polish at it’s most perfect form! The formula is quite sheer so if you’re not a fan of multiple coats of jelly goodness like I am I suggest you layer this on top of a creme polish. The application is flawless and you can apply this so thin that four coats seen on the photos really weren’t a problem at all. Just created amazing depth and squishy-ness (yes, that must be a real word :P). This is four very thin coats and HK Girl top coat. (This was a hard one to photograph accurately so I did adjust the colors on the photos to make the polish look more like it does in real life). This one has such a delicious color combination, perfect for summer! 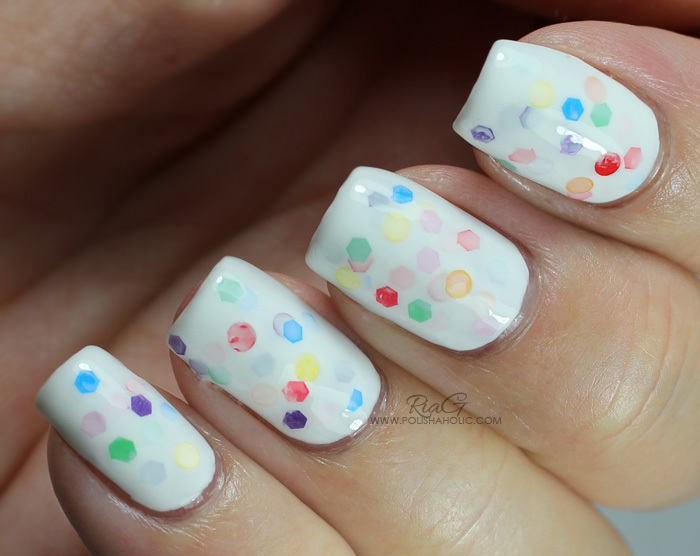 One of those cheerful fun polishes that put you in a good mood :) Application was good and this was easy to apply thinly so you can layer it for a nice sandwich effect. I suggest you turn the bottle upside down before application to help get the stars out of the bottle. This is three thin coats and HK Girl top coat. 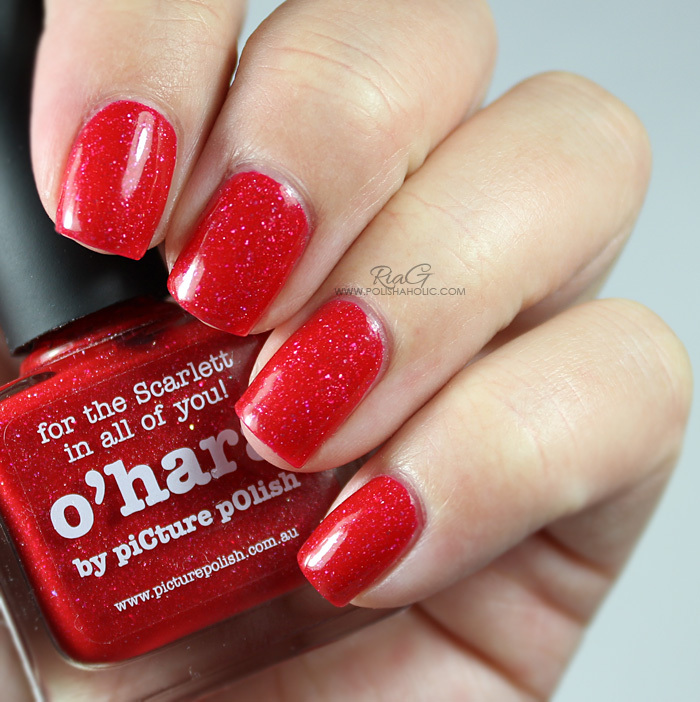 Dollish Polish – It’s So Fluffy, I’m Gonna Die! Dollish Polish polishes recently arrived to a Finnish webstore CesarsShop.fi and I received a few polishes to review too. Today I’ll show you the supercute It’s So Fluffy, I’m Gonna Die! The formula on this was just perfect, smooth, glossy and self leveling. I LOVE this! When I swatched this I didn’t even want to take it off cos it was so cute and pretty! For the photos I applied three thin coats of It’s So Fluffy, I’m Gonna Die! and HK Girl top coat. ***This polish was sent for review. I don’t benefit from clicking any of the links on this post. Jindienails.com has been restocked with sold out colors. New colors launching today (Monday) at noon US central time zone! International shipping available! Seahawks duo – You Mad, Bro? and Everyday I’m Russell’n. And then to the swatch of the day, K.I.S.S. (Keep it Simple, Stupid), which was also restocked yesterday. This is part of the upcoming Recover Me collection and later this week I’m going to show you another gorgeous polish I got to swatch from this collection. You can read the idea and inspiration behind this collection from Jindie Nails website. K.I.S.S. applies smooth as butter and was opaque with two coats. This dries nice and smooth and the top coat brings out the beautiful shine. I love how subtle the glitter is in this and the shimmer gives it a beautiful glow in real life. 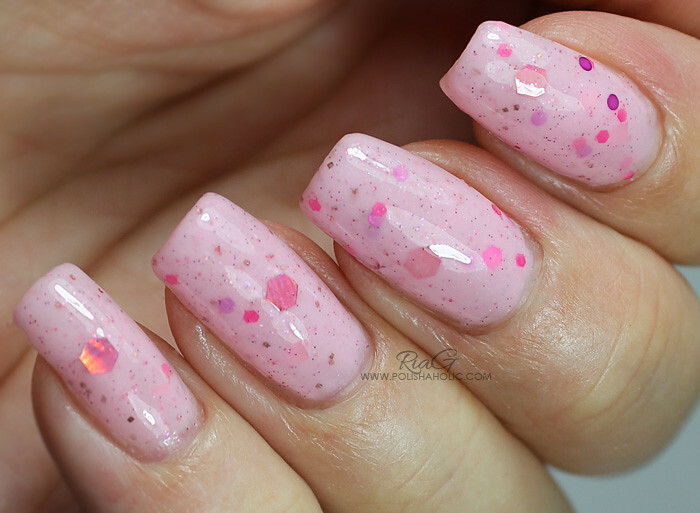 Very pretty and girly looking polish! On the photos I have two coats of K.I.S.S. with HK Girl top coat. Jindie Nails polishes are sold on their webstore at jindienails.com. International customers can find an authorized distributor here. You can also check out Jindie Nails social media sites on Facebook, Instagram and Twitter for more swatches and latest news of amazing upcoming polishes and restocks!